My second visit to this golden city. I was here before, with friends, for four days out of a two-week tour of Northern California in 1994. On that occasion, I swore I’d be back for a longer stay; and now I’ve finally made it, on my own, with ten days ahead in which to explore the home of Armistead Maupin’s Tales Of The City completely at my leisure. After a tiring 11 hour flight, I’ve finally arrived at my digs  the Parker House on Church Street. 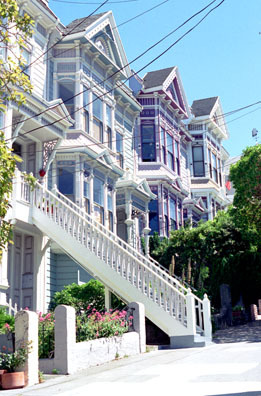 This is a wonderful base for exploring the city, located in a quiet neighbourhood on the boundary between the Castro and Mission districts yet only a 15-minute streetcar ride from downtown. 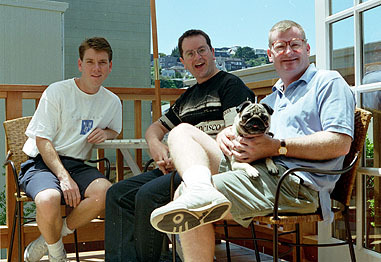 It’s stylish, comfortable and welcoming  Bob (left) and Bill (right, with Parker the dog) are excellent hosts. The Parker House has gradually acquired a reputation as one of the top B&Bs in North America; back in 1997, I was among their first guests. Having settled in to the Parker House, I’m now out exploring the neighbourhood and looking for something to eat. My body clock still hasn’t left the UK and thinks it’s about 3am; but it’s a balmy evening in early summer here, and the lure of Castro Street just three blocks away is irresistible. And I already know exactly what I want to eat, and where. A few chapters into Babycakes ( Tales of the City volume 4), when we catch up with Maupin’s  and my  hero, Michael "Mouse" Tolliver, he’s burying his sorrows in a pizza and a half-litre of the house red at a restaurant called The Sausage Factory, at 517 Castro Street. Italian is the best comfort food and, after such a long journey, there can be no better or faster way of sinking myself into the world of these magical, life-changing books. The restaurant is busy but I manage to get a small table to myself by the window. The menu offers a choice of small, medium, large and extra large pizzas. Imagining it will be the size  around nine inches across  of the kind of individual pizzas popular in Britain, I order a small pizza with sausage, mushroom, cheese, onions and peppers, plus some garlic bread to keep me occupied until it arrives  and to start soaking up all the red wine. I’m well into the second glassful when the pizza arrives. And it is enormous. I mean huge. In the UK, it would have been called "Family Size", or "MegaFeast". It’s delicious, but I’m already starting to feel like the garlic bread has been a meal in itself. I manage to polish off one slice of the behemoth and struggle through another before admitting defeat. Of course, the waiter offers me a doggy bag, and I take it, hateful of waste even though I can’t imagine finishing the meal. Cold pizza isn’t high on my list of food favourites, and back at the Parker House I’ve no easy means of reheating it. Leaving the restaurant, I head right, towards the legendary junction of Eighteenth and Castro. Seemingly out of nowhere a polite Californian voice says, "Excuse me?" I turn to see a shambling young man in the shadows behind me. He has been sitting in a small alcove in the wall, collecting loose change, but has jumped up to talk to me. He’s blond and unshaven, and wearing several layers of clothing as protection against the night air, already turning cold. He looks nice. As soon as I make eye contact, he begins talking very fast, not aggressively but wanting to tell me his story before I have a chance to break away. It’s so fast I only take in a fraction of it, but the main thing on his mind seems to be some blankets that he and a couple of friends had acquired from somewhere, only they’ve been stolen, and now he’s afraid that the night is going to be uncomfortable unless he can acquire some more blankets for him and his friends (wherever they are). I don’t quite grasp where he plans to get the blankets from, but the upshot of it all is that he wonders if I can possibly spare a few dollars. Now, I never quite know how to deal with street begging. I’d rather give money to a charity that supports homeless people  gives them shelter, food and an opportunity to get back on their feet  than put a sticking plaster over a great wound in our society by handing loose change to a few individuals, who’ll probably only put it towards a bit of booze or grass anyway (and who can blame them?). But like I said, this guy seems nice. He’s a bit hyper, but he’s got a sad smile, and his eyes are open and honest, and he smells masculine, warm and musky. My inhibitions dangerously loosened by the wine, I feel an almost overwhelming urge to give him a hug; but I restrain myself, worried that such a gesture might be unwelcome, or at best be construed as patronising. Suddenly, I remember the foil lined white paper bag clutched in my left hand. The remnants of my meal will still be warm. Sleeping rough like this, he must get hungry. Perfect. I hold out the bag. I say, "Would you like some pizza?" For the first time in our encounter, he stops speaking. He looks at me, a little sadly. Then he steps to one side, and I get a proper look at the recess where he has been squatting. It’s full of crumpled white doggy bags identical to mine. Rows and rows of them, like tombstones in a war cemetery, four or five deep, with more piled on top. I take his point. I fumble in my wallet, find a couple of dollar bills and hand them over. He shakes my hand warmly, treats me to that smile again, and says, "Bless you, man. You are so full of love! You take care now, man. Bless you." I walk away down Eighteenth, wishing I had dared to hug him after all.